My exchange is due to be upgraded at the end of June. My question is, sky 80/20 or BT Infinity 80/20? 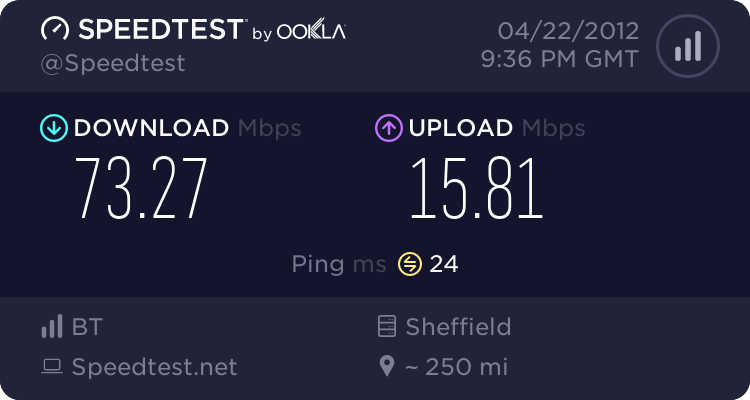 I am currently a sky customer and to be honest, had a few issues with speed. But I'm stuck between them both as sky have a unlimited usage and no throttling where as BT throttle P2P. However, they allow to use any router and seem to get the benefits and upgrades before other ISP's. Any views would be good and thanks in advance. uTorrent on Mac seems to "get around" the throttling out of the box. I find it hit and miss, on uTorrent on Mac. I'm guessing it works on network capacity, quieter it is the less the throttling kicks in. My question is, sky 80/20 or BT Infinity 80/20? Just out of interest why are you limiting yourself to choosing one of these two? Quite agree and not limiting yourself to the worst customer support known to man, there are others. No, im happy for suggestions. They're just the one's that i've currently looked into. No FTTC cabinet yet (originally Mar 2011) THFB PCP 5 - hope for 21st May to 1 June !